The Rhino Fan series is designed to be used with the other members of the Rhino product range. The durable casing is manufactured from reinforced plastic , to give the fan a very strong outer casing that prevents leaks. The fans are easily installed and removed and come with an easy to fit mounting clamp. This means that the range has a fan that will suit every type of grower. Rhino Fans come hard wired and are ready to be used from removal from the box. 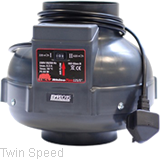 Twin speed 220/360 m3/h, ideal for easy maintenance of room temperatures with no hum! SWITCH DOWN IN WINTER AND UP IN SUMMER!!!! !